Staff are always friendly and helpful. Slight chance to our accommodation but staff were always willing to assist. We really liked the location and being so close to harbour and Salamanca Place. 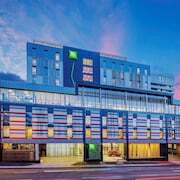 Where to find Hobart hotels near an airport? How can I find hotels in different Hobart neighborhoods? Where can I find hotels in Hobart that are near tourist attractions? You can discover a broad selection of apartment and hotel options in Hobart. Expedia's booking page currently lists 99 hotel options within a 0.1-kilometre (0.06-mile) radius of Hobart's central area. 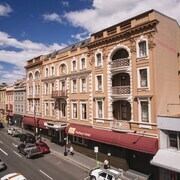 Like to book a room close to the heart of Hobart? The The Henry Jones Art Hotel and Corinda's Cottages are conveniently located 1 kilometre (0.6 miles) of the city center. 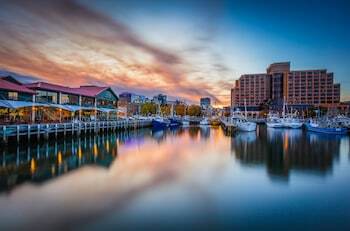 Sandy Bay, 4 kilometres (2 miles) from the middle of Hobart, is a popular accommodation neighborhood that is home to 16 hotels that can be booked through Expedia. The Wrest Point and Amberley House are some of the places to stay in this area. 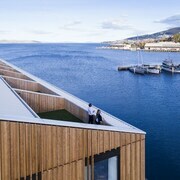 Visitors to Hobart will also find comfortable places to base themselves in Battery Point. This area is 1 kilometre (1 mile) from downtown. 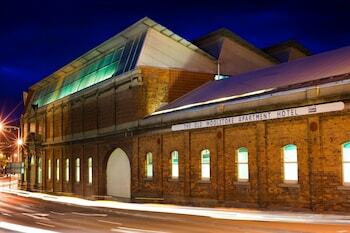 Battery Point's accommodations include the Somerset on Salamanca Hobart and Salamanca Wharf Hotel. Alternative areas with a range of hotels include New Norfolk and Richmond. The Rosie's Inn and Tynwald - Willow Bend Estate are in New Norfolk, while Richmond is where you'll find the Mulberry Cottage B&B and Hatchers Richmond Manor. The Travelodge Hobart Airport and Riversdale Estate Cottages are in Cambridge, while Graham Apartments and Hobart Gables are part of the New Town area. Stay close to the Cascade Brewery by booking a hotel room at the Bay View Villas or, you could also choose the Marquis Hotel Motel. If you'd rather make a base near to theatre Royal, you should try the Somerset on the Pier Hobart or Quest Trinity House. The Royal Tasmanian Botanical Gardens and the St. David's Cathedral are two more much-visited Hobart destinations. 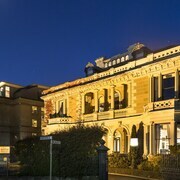 The Salamanca Inn and the Salamanca Terraces are close to the Royal Tasmanian Botanical Gardens. The Gattonside Heritage Accommodation and the Hotel Grand Chancellor Hobart, are near the St. David's Cathedral. 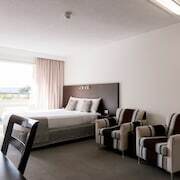 Budget-minded travelers will be delighted to know that there is a decent selection of more affordable accommodations in Hobart. 19 kilometres (12 miles) away from Hobart's downtown area is the Mulberry Cottage B&B. The Huon Bush Retreats is just 30 kilometres (18 miles) away. 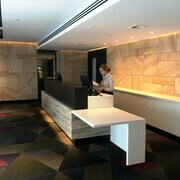 More options in the budget range of Hobart are the Mantra One Sandy Bay Road and the Best Western Hobart. 15 kilometres (9 miles) away from the main part of Hobart, is the Villa Howden. The Moonah Central Apartments is positioned 5 kilometres (3 miles) away. The Quest Waterfront Serviced Apartments and also the Lenna of Hobart are some alternative accommodation options in Hobart. 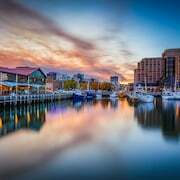 After you've explored Hobart, schedule in a little time visit the other cultural and scenic attractions of the Southeast Tasmania area. Southeast Tasmania is marked by forests. 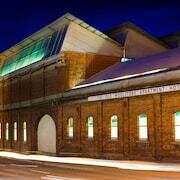 Popular Southeast Tasmania visitor attractions include history museums. Travelers in this part of Australia commonly enjoy hiking, caving and shore fishing. 0.6 kilometres (0.4 miles) away from Hobart you'll find Sullivan's Cove, where you'll find Franklin Wharf and Mona Ferry Terminal. Should you wish to visit Sullivan's Cove, check out the room rates at the Old Woolstore Apartment Hotel and Zero Davey Boutique Apartment Hotel. 12 kilometres (7 miles) to the northeast of Hobart, you may also choose to stay at Cambridge, which is home to the Cornwall Cottage and Hobart Airport Tourist Park. If you're staying in Cambridge, be sure to visit the Grote Reber Museum and Tasmania Golf Club. Visit Expedia's current Hobart travel guide and explore the many things to do, see and eat this area has to offer. What are the most popular Hobart hotels? Are there hotels in other cities near Hobart? What other types of accommodations are available in Hobart? Explore Hobart with Expedia.ca’s Travel Guides to find the best flights, cars, holiday packages and more! Comfort Inn Convention Center/Downtown Washington D.C.
Courtyard Washington, DC/U.S. Capitol Washington D.C.